I love sweet potatoes and you all know I love muffin tins, so when I kept seeing traditional potatoes made into cute little stacks this way I had an epiphany: sweet potato stacks! 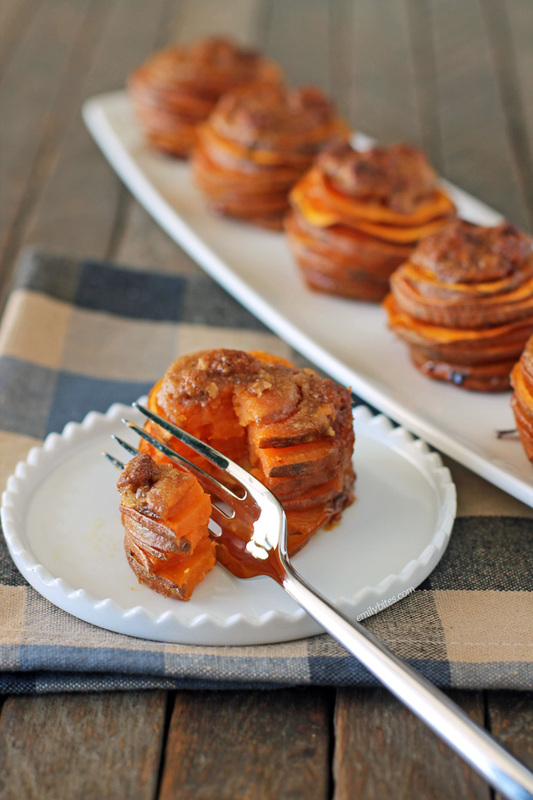 Now, I’m probably not the first person to ever dream that up, but as I continued to think about it I decided to go all out with the idea and top my stacks off with a buttery brown sugar pecan topping: Sweet Potato Casserole Stacks! These stacks are a fun twist on the traditional Thanksgiving casserole, perfectly portioned and just as at home as part of your weekday family dinner as they are on your holiday table. Thinly sliced sweet potatoes are layered with butter, oil and syrup and then topped with a sweet, crunchy topping and each one is only 141 calories or 3 Weight Watchers points! These stacks are a great side dish for any meaty main dish and they are perfect for your Thanksgiving meal or a Friendsgiving party because they look fresh and impressive and they taste comforting and familiar. Looking for more lightened up, tasty side dishes to complement your mains? Check out the side dish section of my recipe index for my Roasted Smashed Garlic Potatoes, Cheesy Broccoli Bake, Garlic Roasted Green Beans with Almonds, Loaded Cauliflower Bake, Zucchini Casserole, Garlic Thyme Roasted Carrots, Cheesy Potluck Potatoes, Spinach and Parmesan Orzo, Parmesan Roasted Sweet Potatoes and many more! Preheat the oven to 375 degrees. Lightly mist a standard size 12-cup muffin tin with cooking spray and set aside. Combine the oil with one tablespoon of the butter, the syrup and the vanilla in a small dish or bowl. 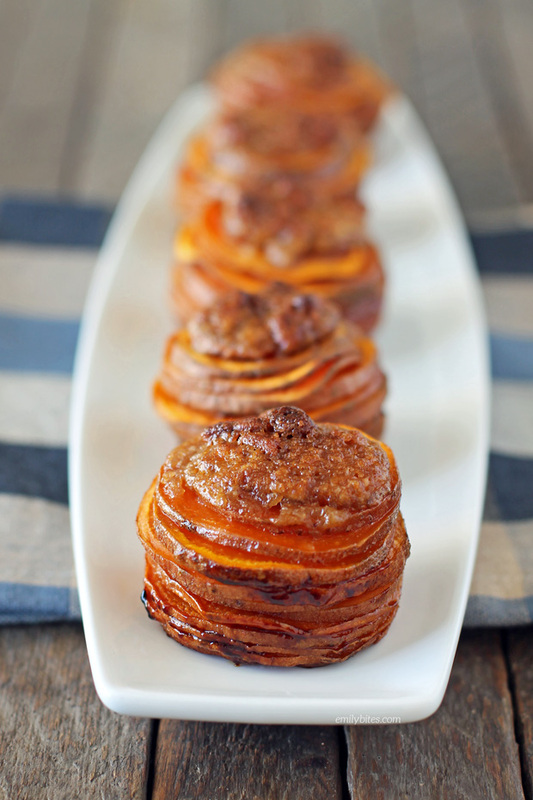 Place the sweet potato slices in a large mixing bowl and drizzle the syrup mixture over the potatoes. Stir until the potato slices are coated. 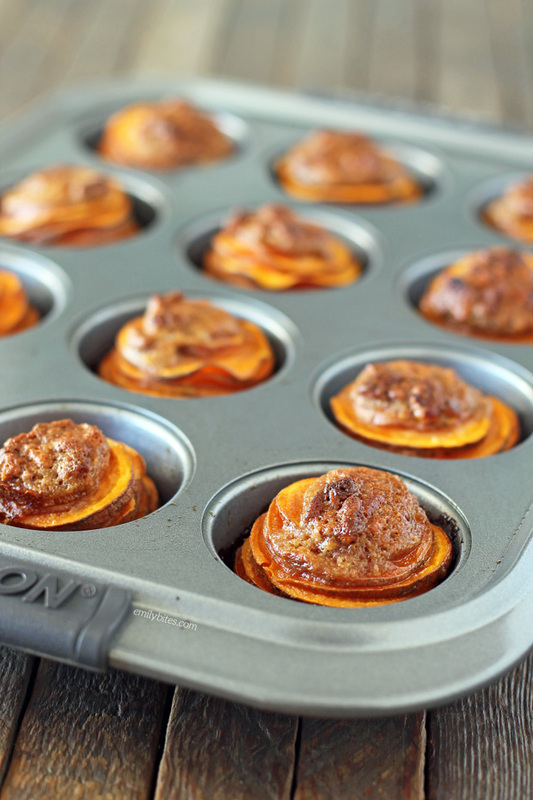 Stack the slices into the cups of the prepared muffin tin to form even piles. In another small bowl, combine the salt with the flour, brown sugar, pecans and the remaining tablespoon and a half of melted butter. Stir together until well combined and then divide the mixture evenly over top of the potato stacks. Place the stacks in the oven and bake for 45-55 minutes until the stacks are cooked through. Can’t wait to get home! How do you remove from tin and keep them so neat looking? Haha is Husbandman your hubby?! Too funny!! How would you reheat these? do they stick in the pan or do they easily come out? I am worried about cleaning the pan. Seems my old muffin tins are really hard to clean. I can’t wait to try these! My pans are nonstick and pretty new, but my stacks slid right out onto a spoon! This sounds like such a good idea for the holidays. I was trying to think of a way not to do a whole casserole since there will be so many side dishes. So I have a question for you. I know this changes the points and calories – I don’t do weight watchers but love lower calorie foods. Do you think I could do a few of these with the miniature marshmallows. I’m afraid the marshmallows might be too big and over power the size of the stack. Some of them I need to leave the nuts out as well because we have a family member with diverticulitis. So I find your recipe easiest to adapt to all food issues, I might even put half the sweet potato in each muffin tin so that other side dishes can be eaten without the guilt. What a neat idea. I definitely think you can do some with mini marshmallows instead of the pecan topping! I haven’t specifically tried it that way, but I don’t see why not. Let me know how it turns out! I hope your whole family loves it! Emily could these be put together ahead of time and then popped in the oven a number of hours later? Can these be made a day ahead of time? Hi Val, for best results I wouldn’t recommend it. You can probably prep a lot of it the day before (slice the potatoes, etc) but I would cook it to serve :). Hi – I made these for Thanksgiving dinner. So easy and delicious!!! They were gobbled up. Thank you! Can I use pure maple syrup instead of breakfast syrup? Sure! Obviously it will change the nutrition information etc, but it should work the same. Do you have a cookbook???? Made these last Thanksgiving….a HUGE it….definitely making again this year! Made this year for Thanksgiving. Turns out the maple syrup in my pantry had gone bad, so rather than run out for more I subbed with a few heaping spoonfuls of orange marmalade I had in the fridge. Still came out great. Probably should have let them cool in the pan longer as they weren’t quite as beautifully stacked as the photos here, but they were a hit nonetheless. These were a new and amazing addition to our Christmas dinner. Will be making again! I signed up for sweet potatoes at work next week. Will these heat easily?